Klook Promo: Say goodbye to physical tickets and get back 5% of your purchase in Klook credits when you buy a Mobile Pass! Skip the delivery time with a Mobile Pass, which enables travel on your mobile phone! easy to use and convenient! cheaper than official website! Get US$7.1 back in Klook credits for your next trip when you book this activity! Complete this Klook activity to get 5% of the activity cost back in free credits to use on your next booking. For example, book US$142.65 to get US$7.1 free credits. Travel all over England without having any transportation woes by purchasing the BritRail England Mobile Pass (Consecutive). 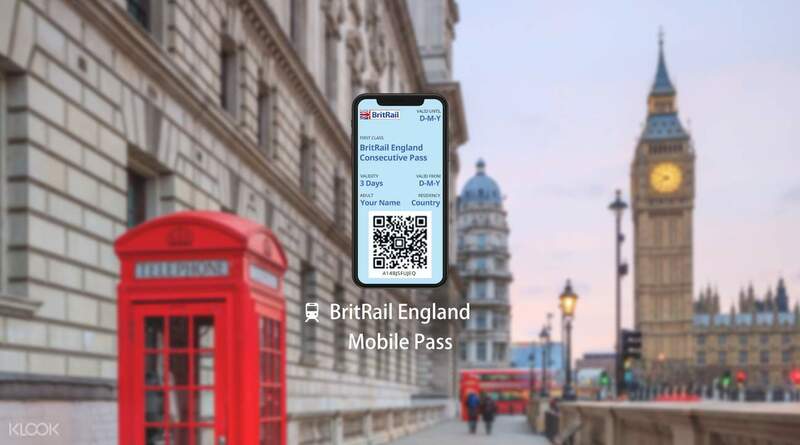 Giving you unlimited train rides for 3, 4, 8, 15, or 22 consecutive travel days, or even an entire month if you require it, the BritRail England Mobile Pass gives you the freedom to explore all of England with one rail pass - no need to purchase tickets separately at each train station! Simply make a booking on the Klook website/app, then activate your Mobile Pass by clicking the link e-mailed to you and downloading the Britrail England Pass on your phone. Once downloaded, you're totally ready for travel! Just present it to any ticket barrier with a QR code reader or to a railway official at the station, and off you go on your adventures. The best part? Not only will you be able to discover iconic cities like London, Manchester, Cambridge, and Oxford without any worries, you'll also get to enjoy added benefits, such as discounted entry fees to the top attractions in Great Britain! See England's best attractions with the BritRail Pass, now available in mobile form! You must present your passport or proof of residence and activated pass on a mobile device to any ticket barrier with a QR code reader or to any railway official who will ask to see your pass at the side gate or on the train. Never leave them at home! Very convenient as you get to skip the queue at the ticketing counter. It is also fuss free when there is a station or track closure, you can immediately change to another line without having to change a ticket etc. Very convenient as you get to skip the queue at the ticketing counter. It is also fuss free when there is a station or track closure, you can immediately change to another line without having to change a ticket etc. I bought the pass only two days before I started my trip in the UK. I didn't get the e-ticket before I got on the flight (it's Friday night) so I was really anxious...I called the helpline and the staff promised they would provide me a response the next day. After 13 hours when I arrived at the UK I finally got the e-ticket. Even Klook allows you to purchase an e-ticket for use just after two days, leaving more time would absolutely be better! I bought the pass only two days before I started my trip in the UK. I didn't get the e-ticket before I got on the flight (it's Friday night) so I was really anxious...I called the helpline and the staff promised they would provide me a response the next day. After 13 hours when I arrived at the UK I finally got the e-ticket. Even Klook allows you to purchase an e-ticket for use just after two days, leaving more time would absolutely be better! Easy booking and quick response. Just remember don’t click the link as it will activate the moment you click it. Easy booking and quick response. Just remember don’t click the link as it will activate the moment you click it. easy to use and convenient! cheaper than official website! easy to use and convenient! cheaper than official website! The pass can be use but the barcode is not working. Need to show the pass to the conductor and they will open the gate for you. The pass can be use but the barcode is not working. Need to show the pass to the conductor and they will open the gate for you. I’ve been waiting for the ticket for a long time for some reason I don’t know, however, it was sorted out in the end. It was very easy and convenient pass to use. I’ve been waiting for the ticket for a long time for some reason I don’t know, however, it was sorted out in the end. It was very easy and convenient pass to use. Thank you for choosing Klook and taking time to leave us a review! We are very sorry to hear about the inconvenience you experienced. Rest assured, this is not the type of service which Klook offers or permits our local operator to provide. We will surely raise this matter to the product manager and local operator to improve and provide an excellent service to all our customers. Thank you once again for your valuable time spend in leaving us a review. Thank you for choosing Klook and taking time to leave us a review! We are very sorry to hear about the inconvenience you experienced. Rest assured, this is not the type of service which Klook offers or permits our local operator to provide. We will surely raise this matter to the product manager and local operator to improve and provide an excellent service to all our customers. Thank you once again for your valuable time spend in leaving us a review.